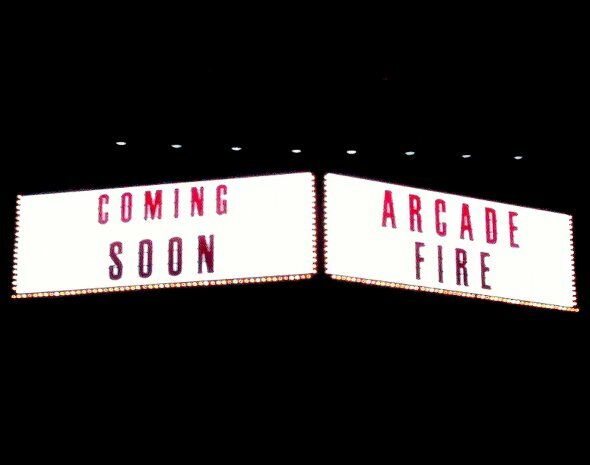 Arcade Fire hasn't played this country, The Netherlands, a lot. Somehow they decided to skip it many times. The Lowlands festival would have loved to have them close this year's edition but the band arrived in our country one week later to play the Heineken Music Hall. With the release of their brilliant and highly acclaimed last album The Suburbs they have grown in one of the more popular indie bands of today. Many are praising their lively performances so it was time to find out ourselves. The band Austra are the ones to warm up the big hall that has already filled up. Their music may be an interesting return to 80s new wave but on stage it's hardly a warm up. Everyone is either hardly moving or moving in the same way the entire show. This stage is definitely too big for them. The dark somewhat cold music doesn't help either. How different this is when Arcade Fire take to the stage and kick it off with the very appropriate 'Ready To Start'. It's clear what their mission is: to conquer the music world by force. The sound is big, the stage setting is big and Win Butler has transformed into a big front man. And this works very well. For one and a half hour they take us on a musical journey through their world filled with beautiful visuals, great music and a very focused band. The show has no weak moments and never falls in. It has a high tempo but also has been stripped from subtleties. The band members themselves are already great to look at with most of them changing positions a lot. Especially Will Butler and Richard Parry are all over the place and are playing with great enthusiasm. Régine Chassagne also is playing several instruments and of course she's getting her share of the spot lights as well. 'The Suburbs' is accompanied by bits of the Spike Jonze directed video and short film 'Scenes from the Suburbs'. All the visuals throughout the show are well chosen and powerful, adding more depth to the performances. When there are no clips to show we can see shots of the band. A great savage version of 'Month of May' with quickly changing shots and stroboscopic lights turns into one of the highlights of the set. After one encore with 'Intervention' and 'Wake Up', one and a half hour later, the show is over. Although it was a convincing show, somehow it didn't look like the crowd was really following Butler's request at the beginning of the show for everyone to stand up and give them energy. Maybe that has to do with the kind of people that are here tonight: men and women into their thirties that are enjoying a night out with live music. The kind of music they listen to at home, nodding their head approvingly to the beat of the music. Arcade Fire could use a larger group of young wild dogs to fire up the party. Although I fall into the group of over thirty myself, they really deserve the response of an excited crowd.